What is the most satisfying food to sustain a three-day-long festival in the streets, filled with swirling dance parties, vibrant samba parades, and free-flowing Caipirinhas? During Carnival in the coastal region of Brazil’s Paraná state, the answer is a hearty dish called barreado (pronounced bah-hay-AH-doh). Barreado’s popularity as a delicacy during the revelry of pre-Lent Carnival has evolved over the centuries to become the quintessential dish of the area, drawing visitors from around the country and the world to enjoy it any time of year in towns like Morretes, where the Novo Fogo distillery is located. Simply stated, barreado is a delicious mixture of stewed beef, cooked in a clay pot for over 12 hours with bacon, bay leaves, and spices, served with manioc gravy, rice, and sliced bananas. Barreado’s genesis was as a dish that could be prepared easily and cooked slowly while people attended Carnival festivities. Like all good stews, barreado tastes just as good when reheated a few days after it’s prepared — just the food to maintain a long weekend of celebration. Barreado literally means “covered in mud” in Portuguese, and the name references the way that the lid of a clay barreado pot was traditionally sealed with a mixture of manioc dough and ash before its cooked over a fire. The dough-sealed clay pot acts as a rustic slow cooker, trapping the meat’s succulent juices inside the pot as it stews over a low flame. The authentic way to serve barreado is to add a few tablespoons of dry manioc flour into a bowl, then to stir in some of the liquid from the barreado stew to form a gravy or paste called pirão — a humble Brazilian staple for centuries. Braised barreado meat is then spooned on top of the pirão and topped with medallions of sliced bananas, usually served with white rice. The final dish is an unctuous combination of savory beef, starchy manioc, and surprising pops of sweet banana, assured to nourish the body and comfort the soul. What follows is a barreado recipe by Chef Maribel Ferreira of O Celeiro Gastronomia, one of the best restaurants in the Morretes area. 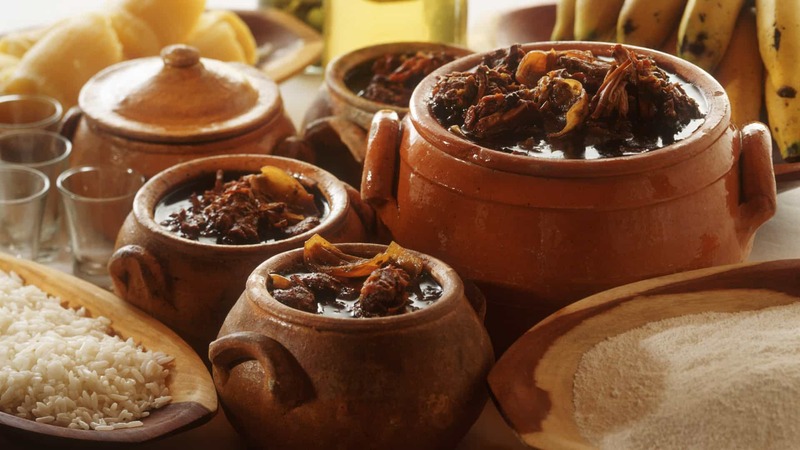 We should candidly mention a contentious point about cooking barreado: purists insist that barreado must only be cooked in a clay pot sealed with manioc dough, never in a pressure cooker or Crock-Pot, as this would disrespect tradition. So if you happen to have a wood fire and a clay pot handy, or if you’re okay with stewing a pot on your stove for at least 12 hours, then by all means follow the traditional technique. But if you’d like to enjoy the delights of fresh barreado in a more convenient and perhaps safer context, we recommend using a Crock-Pot. Just don’t tell Chef ‘Bel we told you so. Cube the bacon into 1-inch pieces and sauté in a skillet over medium heat until crispy on the outside. Remove the bacon pieces with a slotted spoon and drain on a paper towel to drain the fat. Chop the onion into large chunks about an inch wide. Blend the onions with two cups of water in a blender until smooth. Pour the blended onions into your pot. Do the same with the tomatoes, blending with water to make a puree, then add to the pot. Add the beef broth to the pot along with the cumin, salt, and bay leaves. Whisk to combine with the onion and tomato purees, and give it a taste before the meat goes in. It should be savory and zesty. If it’s bland, add more salt to taste. Add the cubed chuck steak and bacon into the pot and stir to combine in the sauce. Pour in enough water to the pot to cover the meat. If you’re going the traditional route of cooking your barreado in a clay pot sealed with manioc dough, this would be the point when you would start mixing a stiff dough of water and manioc flour to seal the lid of the pot. Or if you’d prefer to use a Crock-Pot, disregard the manioc dough part. Cook on low for at least 12 hours. If you’re using a Crock-Pot, at the very least resist the temptation to remove the lid. When it’s done cooking, the meat will fall apart easily. Give it a taste and season with more salt if it needs it. Serve with pirão of manioc flour and stew liquid, fresh white rice, and sliced bananas (as explained above). A little drizzle of your favorite hot sauce will make it even better. It goes without saying that the best beverage to enjoy with barreado is a frosty cold Caipirinha. Saúde! *We’re recommending to use beef broth as an alternative to dry beef bouillon, as in the video. Just be sure to compensate with enough salt.